Well to me anyway. I tell anyone who will listen that answering clinical questions needs to be approached systematically. Brian Haynes, MD developed the 6S approach to finding answers to clinical questions. This diagram shows what the 6 S’s are and examples of each. The principle is to start at the top and work your way down until you answer your question. Resources toward the top are the most methodologically sound and most useful. Single studies at the bottom are the most prone to bias and most work to use. Previously you had to access each individual resource at each level trying to find answers to your questons. Well no more. I stumbled upon ACCESSSS Federated Search engine today and its incredible. (http://plus.mcmaster.ca/ACCESSSS/Default.aspx?Page=1). It searches the 6S hierarchy for you showing resources that can answser your question at each level. Its much better than the TRIP database. What’s more you can request that they add your library so that you can have full access to resources your library subscribes to. 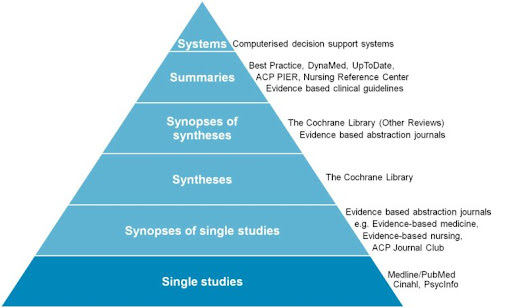 ACCESSSS is a service to help provide current best evidence for clinical decisions. It conducts literature searches simultaneously in several different evidence-based information services (online evidence-based texts, and pre-appraised journal publications). ACCESSSS also provides email alerts to newly published evidence in the user’s chosen area(s) of training/interest. I hope I can convince my library at UAB to request that they be added as a resource. It appears to be the holy grail of search engines. Thank you McMaster HiRU!